It’s time to honor the real pros who keep this community and economy moving. The ones who make sure you get to work, the classroom, the doctor’s appointment, the championships, the concerts and the special times with family and friends. Whether you are boarding a Metro or Sound Transit bus, the Doc Maynard or Sally Fox Water Taxi, a Link light rail car or a Seattle streetcar, or a paratransit van, join us in giving thanks. 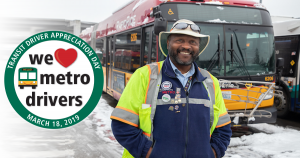 On March 18, 2019, we’re celebrating International Transit Driver Appreciation Day, and we’re asking riders to say thank you. 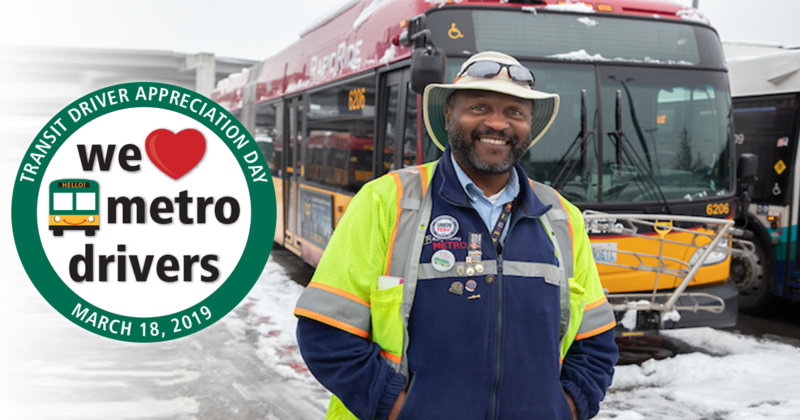 Take a moment to share your appreciation with any of King County’s nearly 3,600 professional transit operators. Together, they earned more than 3,100 rider commendations in 2018 for their driving skills, helping people, and providing quality customer service. Mobility is a human right, and transportation is essential for accessing opportunities in employment and education. King County employees deliver a service that strengthens our community and economy – safely maneuvering through tedious, unpredictable traffic and stormy weather. File a commendation through our website (note the 4-digit coach number, route and time). Print and sign a “thank you” card from our website, or select and deliver your own card or note of appreciation. The sentiment is appreciated behind baked goods and flowers (items which do not have economic value) and they can be accepted, but keep in mind they can be difficult for our drivers to accept from the public – especially while driving. History: Listen to this 2017 KBCS interview with the Seattle-based founders and Carla Saulter who created and first promoted International Bus Driver Appreciation Day.